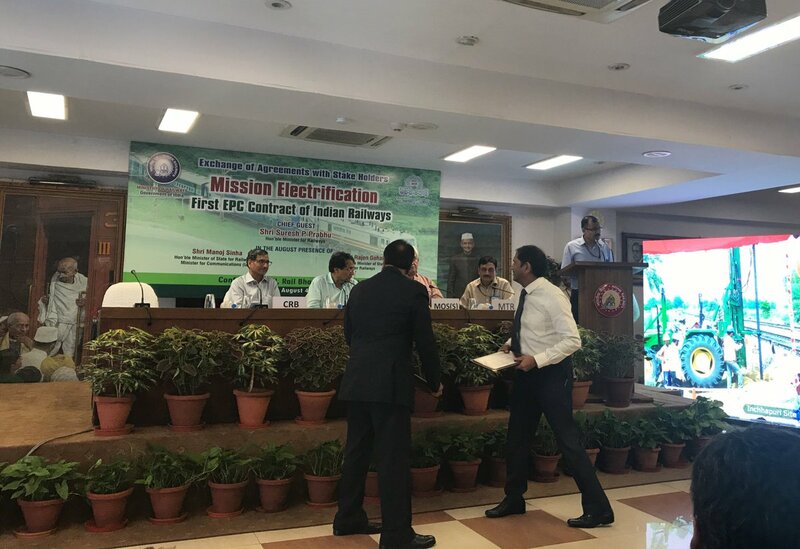 Minister of Railways Shri Suresh Prabhakar Prabhu was the Chief Guest at Exchange of Agreement with Stakeholders as part of “Mission Electrification” & “First EPC (Engineering Procurement Construction) ” contract of Indian Railways. Minister of State for Railways & Minister of State for Communications (Independent Charge) Shri Manoj Sinha was specially present to grace the occasion. Chairman, Railway Board, Shri A. K. Mital, Member Traction, Railway Board, Sh Ghanshyam Singh and other Railway Board Members and senior officials were also be present on the occasion. Speaking on the occasion, Minister of Railway Shri Suresh Prabhakar Prabhu said that Indian Railway has given higher thrust on infrastructure creation, electrification. During last 4 years, total 103 Railway Electrification projects consisting of 16,815 route kilometer at estimated cost of Rs 17, 615 crore have been sanctioned. Indian Railways for first time build partnership with multifold agencies for execution of Railway Electrification projects by entrusting 1735 rkm of RE projects to IRCON, RITES & PGCIL. Minister of Railways further emphasized that cumulative saving due to electric traction bill will be about Rs 26,000 crore in a decade which will be in addition to saving of Rs 41,000 crore planned to be achieved due to reduction in cost of power to Railways. Mission Electrification shall also make Indian Railways more environment friendly. Indian Railways had launched Mission Electrification on 3rd Nov’16 under the guidance of Minister of Railways Shri Suresh Prabhakar Prabhu, for electrification of 24,400 route kilometre (rkm) of BG network in next five years i.e. almost equal to what has been done from introduction of electric traction since 3rd Feb’1925. In order to make this ambitious project successful, Indian Railways for the first time has changed from Business as usual (BAU) approach and entrusted new electrification works not only to Railway PSUs like Rail Vikas Nigam Limited (RVNL), Indian Railway Construction Company (IRCON) and Rail India Techno Economic Service (RITES) but also to Power Grid Corporation India Limited (PGCIL), a well known transmission sector PSU under Ministry of Power (MoP). As part of Mission Electrification, in recent past 10 different electrification projects covering 2516 route kilometer at a cost of about Rs 2797 Cr. have been finalized in a short duration. Indian Railways also for the first time for effective management and fast execution of project has awarded Engineering, Procurement and Construction (EPC) contracts for Electrification of Delhi Sarai Rohilla – Rewari and Alwr – Bandikui – Jaipur – Phulera – Ajmer (353 RKM) section at a cost of Rs 594 crore and Roha – Verna (428 RKM) of Konkan Railway at a cost of Rs 456 crore to M/s L&T. For faster execution of Railway Electrification projects, BAU approach has been changed. Emphasis has been put on mechanized execution of OHE construction works. It has been planned to introduce Self Propelled type Wiring Train for faster and efficient wiring of both catenary and contact wires and Self propelled type Multi Utility Vehicles for faster mast erection within shorter block period. Similarly, pre cast cylindrical foundation (cast in-situ) and prefabricated foundation is also being introduced for mast erection. In addition the project approval/ sanctioning process period has been streamlined and normal 24 months has been reduced to about six months only. For fast track execution of projects adequate and timely funding of the projects is being ensured Extra Budgetary Resources (Institutional Financing). First EPC (Engineering Procurement Construction) based contract of Indian Railways valuing Rs 1050 Cr. for 781 rkm with M/s L&T. The contract has been awarded by CORE and Konkan Railway for major electrification projects. In this event additionally eight agreements were exchanged between Zonal Railways and Public Sector Undertakings for 1735 rkm of electrification projects valuing Rs 1746 Cr.